VACCINE clothing focuses on clean simple lines creating minimalist pieces easily transferable from day to night wear. VACCINE was born in London in early 2013. Dedicated to providing effortless, timeless clothing with relaxed cuts in high quality fabrics and materials. 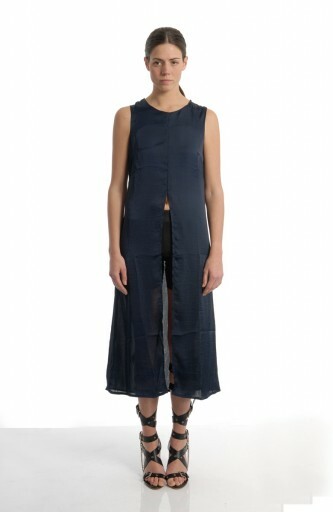 Relaxed oversized lycra jersey dress with leather look sleeves and chiffon mullet hem. Central split dress in hammered satin. Minimalist shape loose fit dress in black extra soft sandwash satin. Minimalist shape loose fit dress in skin colour extra soft sandwash satin. Minimalist shape loose fit dress in light blue/grey colour, made from extra soft sandwash satin. Minimalistic clean cut box shape sheer top in skin colour. Minimalistic clean cut box shape sheer top in black. Minimalistic clean cut box shape sheer top in black and white.